The Town of Huntsville is home to roughly 20,000 people and is located two hours north of Toronto in the Muskoka Region of Ontario. 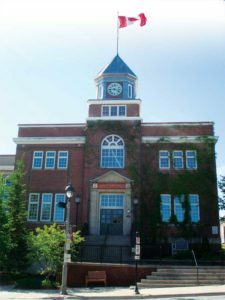 The Town Hall, a two-storey, multi-wythe brick masonry structure, is the only administration building in the region in the Classical Revival style. It is constructed of loadbearing brick masonry exterior walls with a combination of wood stud framing, hollow clay tile, and brick masonry interior walls. The focus of this article is restoration of the eight-sided clock tower, home to a four-sided clock that was moved from Union Station in Toronto to the Town Hall in 1927. The two-level clock tower consisted of two wood floors and roof framing supported on multi-wythe brick masonry walls. The square-shaped lower level of the clock tower was at the same framing elevation as the main roof. The eight-sided upper level of the tower was supported on wood floor joists spanning between the brick walls of the lower level. The lower and upper levels of the tower had the approximate plan dimensions of 4900 x 4900 mm (193 x 193 in.) and 3950 x 3950 mm (155.5 x 155.5 in.) respectively. The tower extended above the main roof structure approximately 8250 mm (325 in.). 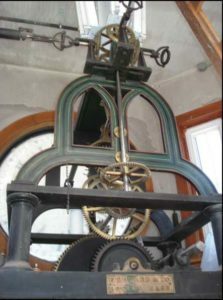 The roof of the clock tower consisted of an eight-sided, stainless steel standing-seam roof. The exterior of the wood stud walls of the upper tower were sheathed with painted wood panels. waterproofing of flat podium level of the clock tower structure. A restoration contractor from Toronto was retained by the Town of Huntsville to complete the repair work. Construction of the original repair scope started in spring 2013. The clock mechanism was removed and the floor framing below it was reinforced. Construction halted after the contractor removed the interior plaster wall sheathing because significant deterioration of the multi-wythe masonry wall construction was discovered. At the contractor’s request, the author was brought in to review the condition of the brick walls because the deterioration of the inner-wythe was severe. Mortar loss and spalling was extensive in the exposed area. The softer inner-wythe of the brick wall was in very poor condition and the structural integrity of the wall was in question. The author recommended the remaining interior finishes be removed from the lower level to facilitate a more complete assessment of the conditions. The restoration efforts were put on hold until a detailed assessment of the brick could be completed. It was determined shoring of the tower floor framing would remain in place until a revised repair scope could be established. On September 17, 2013, a detailed assessment of the brick walls was completed. The deterioration noted previously was found to be prevalent throughout the exposed structure. 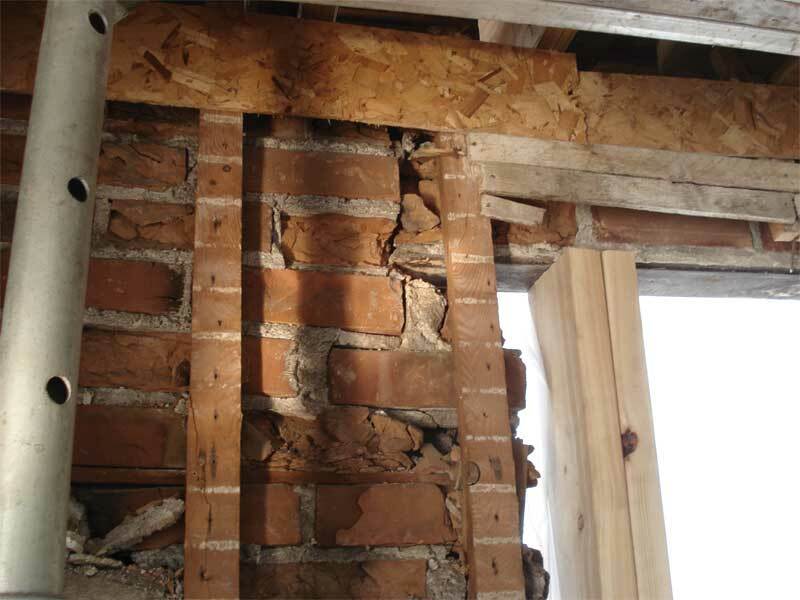 The damage to the brick masonry was most severe at the two loadbearing walls (Figure 2). The interior wythe was no longer significantly contributing to the structural integrity of the walls. Damage was noted to be most extensive at the top of the masonry wall. The condition improved nearer to the building’s main roof. It was decided the condition of the brick masonry walls posed a life-safety risk and had to be repaired immediately. The Town of Huntsville wanted to maintain the heritage characteristics of the structure and preserve as much of the original building as possible. 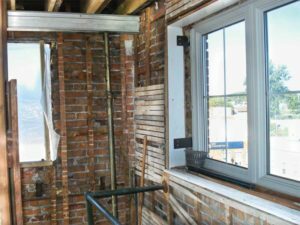 It was decided to completely rebuild the two loadbearing sides of the structure where the deterioration of the brick masonry was most severe. The nonloadbearing sides would be locally repaired and the inner wythe would be reconstructed. 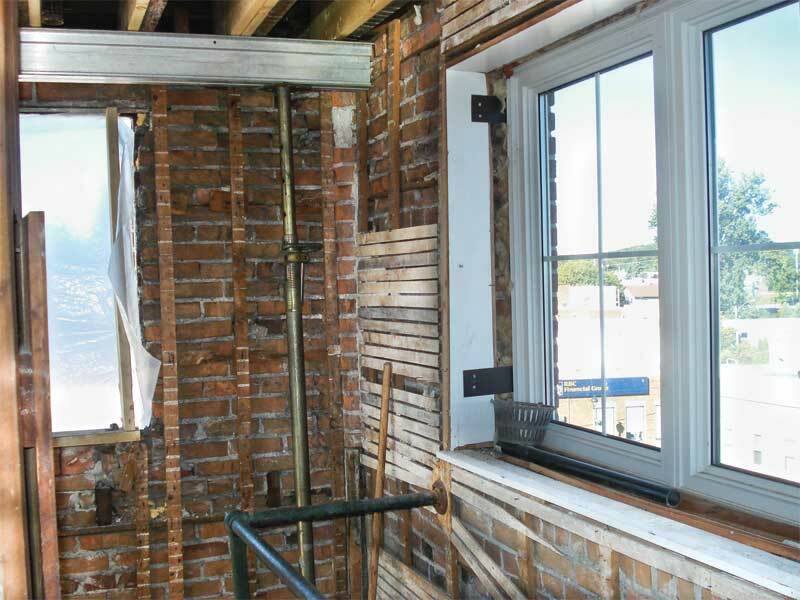 However, there were two main concerns with the proposed remedial work: finding suitable replacement material and the sequence of brick removal and replacement. Since the existing brick exterior wythe was still in good condition, the project team decided to reuse it after cleaning. The restoration contractor was then able to find a suitable brick to match the size, material properties, and style of the exterior wythe. This approach of blending the existing brick from the exterior wythe and the new brick was also approved by the town’s municipal heritage committee. The sequence of construction was challenging. It was decided the best way to proceed was to work on one side and one corner of the building at a time while leaving the rest of the structure intact. A series of interior wood stud walls were constructed within the lower level of the tower that transferred the weight of the tower above to the lower tower floor. The shoring walls were sheathed with plywood to provide additional lateral rigidity to the building during construction. To complete the repair to brick masonry, scaffolding was constructed around the tower, allowing for a more detailed review of the exterior masonry wall facing the street (north side of the building). During a construction review on November 7, 2013, the exterior brick and mortar joints on the north wall were found to be in poor condition just like the two loadbearing walls. Another finding was two of the four walls were noted to have a full extra course of brick within the walls. The variation in mortar joint thickness around the tower can be seen in Figure 3.